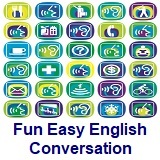 ﻿ Fun Easy English - new classroom free online classes english language lessons speaking listening writing reading april 5. 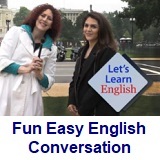 Today in the Fun Easy English classroom you are going to learn some slang beginning with the letter E.
Today learn slang beginning with the letter E.
earful gossip My friend gave me an earful about the neighborhood. earful scolding He really gave his daughter an earful when she came home late. excellent good That's excellent man. eyeball look at She likes to eyeball the guys at the club. eye popper astounding That girl is really an eye popper. 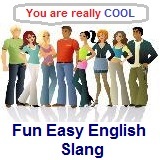 The slang an "earful" is pretty useful and, as shown above, can be used in a couple of situations. 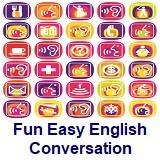 If someone tells you a lot of gossip then they are giving you and earful about some topic. If someone, like your boss, is angry at you then they might give you an earful meaning they will scold you and possibly even yell. Jane: I hear you’ve been ill.
Cathy: Well, I had the flu for a couple of weeks, but I’m fine now. Jane: You’re looking well. By the way, did you hear about Mrs. Jackson? Cathy: No, What about her? Jane: She had such a bad case of the flu that they had to take her to the hospital. Cathy: Oh, I’m sorry to hear that! Note the omission of that, as is usual in reported speech in casual conversation. An interjection, used here simply as an introductory word. 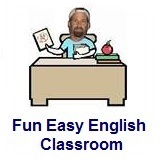 Here well is an adjective meaning healthy. 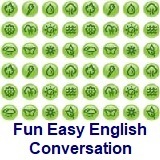 Are looking is, in this sentence, a linking verb. This is a typical “result” sentence. This is the “general” they. This clause is equivalent in meaning to the passive She had to be taken.